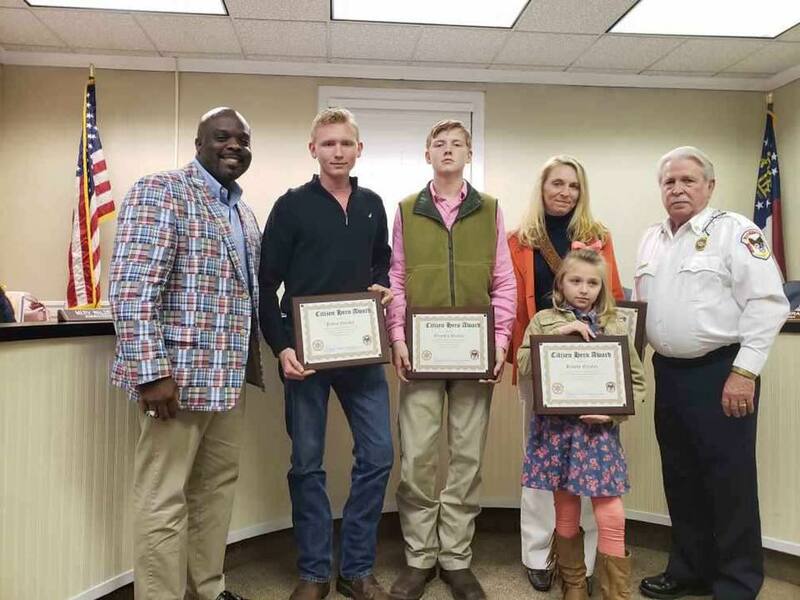 Chief Rusty Sanders of Burke EMA and Sheriff Alfonzo Williams of the BCSO presented Mrs. Jennifer Greeley, Brooke Greeley, Justin Greeley, and Graysen Greeley with a local Citizen Hero Award tonight at the Burke County Commission meeting. Commission Chairman Allen DeLaigle also thanked each member of the Greeley family on behalf of the Burke County Commission and thanked them for their heroic actions. On Monday, 10/15/18, Burke County EMA Firefighters responded to a structure fire at Chris and Jerry Drive in Burke County. While out on the scene of the structure fire, it was learned that Brooke Greeley (8 yoa female) was playing in the yard when she overheard Mrs. Palma, an elderly female from the fire screaming for help. Brooke saw that the house was on fire and she ran into her home to notify her mother, Jennifer Greeley, of the situation. 911 was notified and then Jennifer Greeley and Graysen Greeley (15 yoa male) ran from their residence to the structure fire, which was one house down. At this point the house was engulfed in flames and the Mrs. Palma had come out to the front porch. The shrubs and vegetation in the front yard were so overgrown that Mrs. Palma was stuck on the porch. Mrs. Greeley and Graysen were able to clear a path to get to the Mrs. Palma and then assisted her to safety away from the fire due to her mobility away. She informed them about her dogs and Justin Greeley (17 yoa male) ran to the back door in an effort to get the dogs out but was unable to do so. After Graysen assisted Mrs. Palma to safety he tried to call the dogs from the front door but the fire had spread through the whole house and the ammunition in the house started going off. Graysen and Justin left the immediate area for safety and Burke EMA Fire/Rescue and the Sheriff’s Office arrived shortly thereafter. When it was time to “Step Up” The Greeley family members did just that. Now, you can help as well. The family did not have insurance and a Go Fund Me page named “Help Thy Neighbors” has been set up to provide assistance.